The power couple have been at the centre of pregnancy rumours after the Bootylicious singer was snapped with what looked like a baby bump earlier this month, but the hip-hop star has set the record straight, telling E! News their nine-month-old daughter Blue Ivy won't be a big sister just yet. 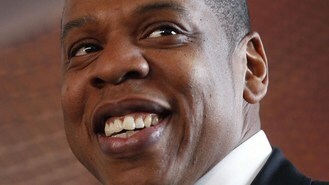 Asked if he and Beyonce, 31, were having another baby, Jay-Z replied: "Tonight? No." Asked whether they might be hearing the pitter-patter of tiny feet in nine months, he responded: "Not in nine months. Absolutely not." The 42-year-old star, who was speaking at an event at his 40/40 club in New York, continued: "Not in one, two, three, four, five, six, seven, eight or nine months."